Lavi Industries' fixed mount 7" x 11" sign frames for Beltrac® crowd control stanchions come in a vertical or horizontal orientation. They enable setting and locking the frames on top of a Beltrac® post utilizing the grooves of the stanchion. These exclusive Beltrac® frames are the best in the industry. They feature radius corners, eliminating sharp edges near your customers. 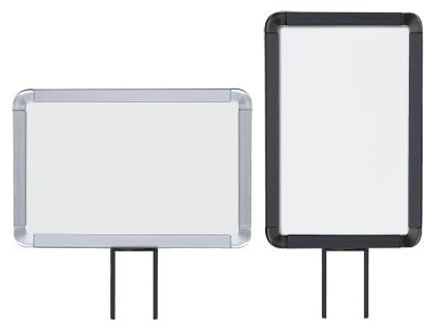 Each frame includes twin clear acrylic panels designed to accept regular paper. Choose between a slotted frame top for easy graphic change or a fully enclosed frame for a tamper proof sign. Choice of four finish colors: matte black, satin, chrome and gold. Lavi Industries' fixed mount 7" x 11" sign frames for Beltrac® crowd control stanchions come in a vertical or horizontal orientation. They enable setting and locking the frames on top of a Beltrac® post utilizing the grooves of the stanchion. Choice of four finishes.